Speedy Collect have given you the oportunity to have your local shops & Restaurants delivered to your doorstep at a push of a finger. Our team gathers information from every restaurant & shop on a regular basis to ensure our data is fresh. Speedy Collect offers the convenience to order Food, Beverages, Snacks & anything from your Local Shop online & at a wide gastronomic range, from which you can create your favourite orders via our app or online with a few fingertips. 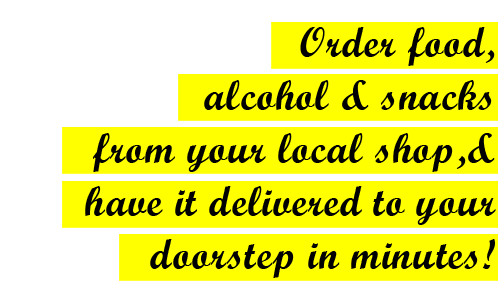 Sit back and wait for your order to be delivered to your doorstep speedy!, whether it's Alcohol, Tobacco, Chocolate, Drinks, Eggs, Milk or 10 packs of Sweets, you can have it all. Our vast community of Speedy Collect lovers share their reviews and photos, so you have all that you need to make an informed choice.